Anyplace Control is a remote control software, that allows you to operate a remote computer as if it were on your own desk. Your keyboard and mouse control the remote PC, your monitor displays remote computer's desktop. Software includes: File Transfer between PCs; Cut and Paste between PCs; restart and shutdown remote pc, lock remote mouse and keyboard, turn off remote monitor etc. 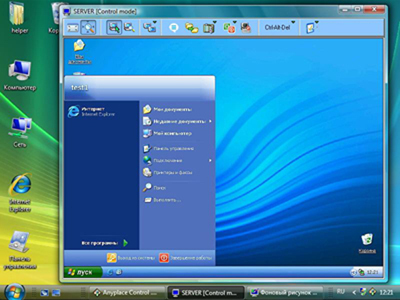 The software can be installed remotely on the other PC. Application remoting: Tunnel any Windows application onto remote desktops (including Linux and Mac) and save on administration & support. Install the application once on the server and eliminate the administration hassle of deploying the applications on all workstations. Allow users outside the firewall secure access to corporate applications by tunneling the applications onto their remote desktop/notebook via SSL!